Late Douglas Adams had the knack for describing things that would resonate with geeks in general and computer scientist in particular. His explanations of the Electric Monk in Dirk Gently’s Holistic Detective Agency regularly come to my mind when talking about dysfunctional computer systems. Another device devised by him is the total perspective vortex, a machine that would give during a short moment a sense of perspective to a human, rendering him mad instantly. One thing that is difficult to put into perspective is the tremendous growth of computers systems. 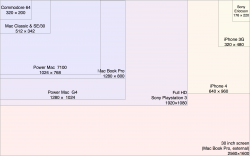 After my post about Commodore 64 graphics, I wanted to get a sense of scale of the various computer screens I used over my lifetime, so I did a little graphic. Here are the resolution of various computers I owned. The encompassing box is the 30 inch screen I use at work nowadays, which has a resolution of 2560 × 1600. This entry was posted in Computer Science, English, General, Guru Meditation and tagged graphics, Resolution. Funny, I’ve showed my son today one of my favorite games from about 1986 (?) on a Macintosh (Mac manager, an economical simulation). I use minivmac for the emulation. 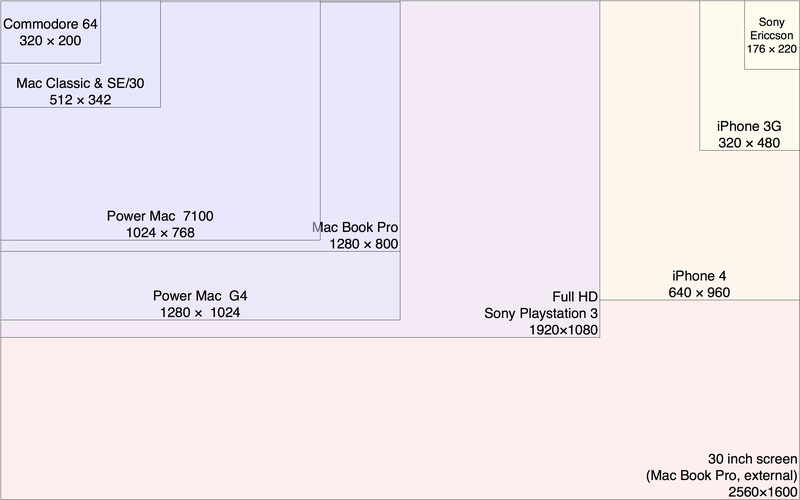 That gives a 512×342 window on a 1920 x 1080 iMac screen. What a difference! And the game is still so good in such a small window.